Just to prove that retro gaming can be an incredibly expensive hobby, here's the eBay auction for Stadium Events. And, yes, it's a sealed copy of a ridiculously rare and expensive game for Nintendo's NES, that might just sell for over 10,000$. Oh, and it's US only. The rarest licensed game for the Nintendo Entertainment System (NES), Stadium Events, sold for a staggering $13,105 on Ebay, 13/02/2010. 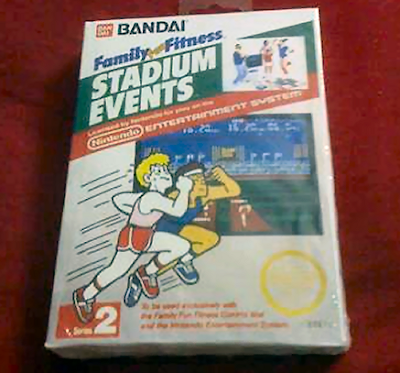 Stadium Events is recognized as the rarest licensed game for the NES as it was originally released in Japan and then made it's way over to the United States where only a few hundred lucky consumer's got their hands on the game.Another eBay auction on an new, factory-sealed version of the game was sold on February 26, 2010 with a winning bid of $41,300. Too many copies in a single month for a such rare game, don't you think? First of all, I'm once again impressed by your knowledge dear Archeogamer. Always a pleasure to have you around, mind. Judging by the knock-off Transformers products that are turning up more and more (and imagine how complex those are to make!) I could see someone trying to reproduce a product that fetches between $13,000 and $41,000. However, aging it? Making the game actually work? Ok I admit that's a pretty tall order! Oh, and fascinating research Archeogamer - it does smell fishy! Well, I for one am impressed... I still believe it's pretty hard to fake something like that, but provided the money is worth it, anything is possible I suppose. Oh, believe me I'm impressed too - I love seeing these astonishing marquee A-list titles pop up now and then. Puts my little Master System and Vectrex collection in perspective! Hovering at an even $10,000 now - awesome! Hopefully not due to any 'pepperoni face pimples' bidders.